Are you ready to leave your full-time job and start working for yourself? It’s a bold and terrifying step. Thankfully there’s now a step-by-step framework to help you create an action plan to leave your ‘safe’ job with a big, sturdy safety net. What we loved about it! What makes Michelle’s e-book unique? We all have books that we buy and never read. To ensure this one doesn’t fall into the same category, Michelle created the entire book as a workbook for you to complete by the time the playlist is over. In just 2 hours, you can have your plan for saying goodbye to your boss and hello to your future! Most business guides tell you how to start your business but no one really addresses how to leave your old job! This guide will let you stop making excuses and start making money. Plus, Michelle promises to drink a mimosa for you when you email her to say you’ve made the leap. 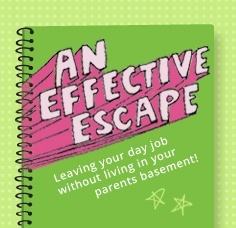 If you’re stuck in your cubicle but daydream about working for yourself every hour you’re there, you will love Michelle Ward’s e-book, An Effective Escape. Making the leap from a ‘normal’ job to a creative job is one of the most frightening things you will ever do. However, you don’t need to do it alone and you don’t need to do it without some help from someone who has done it themselves.